These inquiries came in through Disqus comments, YouTube comments, and occasionally over email. So it's about time I create a post to help proactively answer that question, once and for all. Enter Promo Code cssept15 then click apply. My collection of over 350 videos on YouTube was created and/or edited with Camtasia Studio 8 for Windows. I have put hundreds of hours into creating and editing this vast library, and the little secret is that it takes a lot of time to produce a polished, well-edited how to video. But Camtasia Studio 8 makes a bit less work of it, and it's also what the folks at Pluralsight (Developer, IT & Creative Training by Pros) use. I record using Camtasia Recorder and iOS devices for MOV files that I import, seel also Pro-tip #1 below. Camtasia Studio 8 helps make my produced look better, cutting out (or speeding up) the boring parts, eliminating the useless moments that happen when recording live "tinkering" sessions in my home virtualization lab. Since TinkerTry and the TinkerTry YouTube Channel were both launched on June 2, 2011, I've been using HD video for most of the content. That's a full 1920x1080, since much of the software I demonstrate requires at least that many pixels to really be useful, and these days, such displays are rather common. I actually use the Camtasia editor view to scrub through to the right spots, to get just the right screenshots for the articles I often publish to go with the videos. I also use Snagit for Screencapture, used for the thousands of images all over TinkerTry. See also the closely-related Pro-tip #2 below. 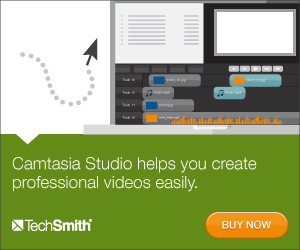 If you have given the 30 day trial of TechSmith Camtasia Studio a try, and the time has come for you to buy, please consider using these affiliate links below to show your appreciation for this article, at no cost to you. This technique avoids resizing that will degrade your screenshots. you are now ready to grab an image for your post that is already the exact dimensions you want, avoiding the need resize, so it will be nice and clear. This article, and most TinkerTry articles, are your examples. I do hope TechSmith goes forward with plans to develop a truly 64 bit version of Studio, as videos over an hour in length with >100 edits can sometimes crash. It usually recovers the work upon restart, but I'd rather it not happen in the first place. Meanwhile, I save my work before making a lot of audio edits. No software is perfect, and I've tried many other video editing packages over the years. For me, Camtasia's easy tie in with YouTube for uploads, along with relative ease-of-use and the fact that many of my peers and work colleagues also use it, means it was well worth the investment. For me, and my valued site visitors. 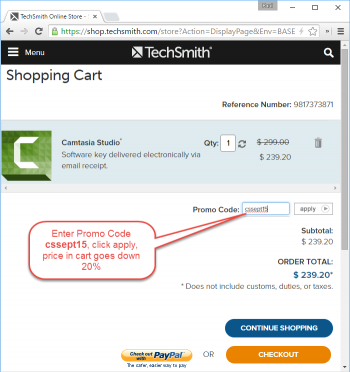 To be a well-informed shopper, see also TechSmith's support site here, and support forums.